Since centuries, embroideries & quilts (Dhadkis) have been made with love and affection by the rural craftswomen in this region, for gifting their daughters while getting married, popularly known as dowries as well as for personal use. A bride would proudly carry to her in – laws house beautiful embroideries for her, gifts to the groom and a quilt collection. This craft has been passed from generation to generation in Kutch, by most of the ethnic communities who settled in Kutch in the last 400 to 500 years, moving down from places like Sindh inPakistan, upwards and the western parts of Indian sub-continent. They carry the impressions of various regions that their ancestors must have moved through, before settling inKutch. The interesting traditions and creative minds & skills of these communities gave birth & space to craft traditions. Having been through arid regions, the women may have created colorful objects to fill their life with colours. The women continued to do the wonderful embroidery, patchwork, and appliqué to make their own costumes, bags, pillow covers and other decorative objects all these years. Embroidered items were not only made for themselves, but adorning their homes and even cattle. The past century has seen a major upheaval in these craft traditions and the creations, with the influence of external factors. The crafts of Kutch started getting exposed to the outside world after the 1950’s when tourists, researchers, anthropologists, craft collectors & lovers etc started discoveringKutch and the craft traditions of its various ethnic communities. 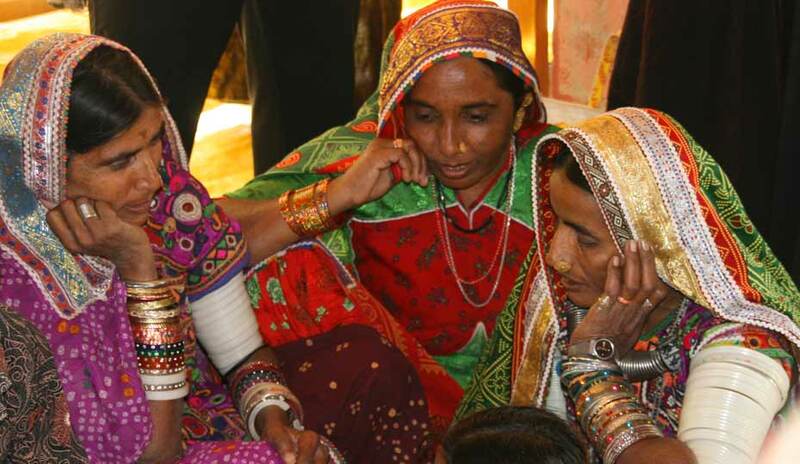 Qasab-Kutch Craftswomen’ Producer Co. Ltd.
Kutch | Gujarat | India.